One Step Closer to Pope Francis! Pope Francis is in the United States! It's an exciting time for Catholics (and all Americans) to see him in our home. PCSBC is even more excited because we are one step closer to seeing him in his home - Rome! In only three short months, we will be on our way to the Vatican to sing for Pope Francis' New Year's Day Mass of Peace in Rome. We are part of the International Congress of Pueri Cantores, the official youth choir of the Catholic Church. With all the excitement of the Holy Father's visit to the United States, we realize we will be even closer to him on New Year's Day. We will be joined by 5,000 children from all over the world singing in the Church's language - Latin. We still have so much to do! Our final payment for our 46 singers is due to the travel agency one month from now. The cost for each child is $3,500 and we have raised enough money to make the payments so far. However, we do not have enough money to make the last payment. NOW is the time to get the word out about our trip. We are the only choir from Arizona invited to sing at the International Congress and one of about 20 from the United States. It is a chance of a lifetime. Please help support our mission to Rome! Go to our YouCaring page and donate whatever you can! All amounts are appreciated. Click on the link to the right to get to our YouCaring page or just search for "Pueri Cantores". People are already starting to notice! 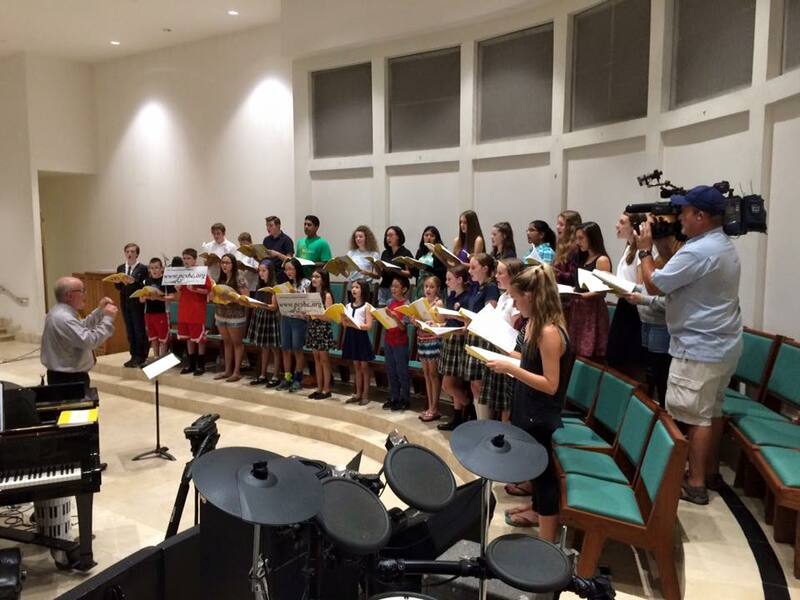 Check out our rehearsal today with special guests from Fox10 Phoenix! If you are visiting this site while waiting for your car to be washed, we thank you! If you aren't at the car wash but are still visiting our website, welcome! Let us tell you a little about Pueri Cantores St. Bernard of Clairvaux (PCSBC). Are you a poker player? Love watching it on TV but afraid of playing in a casino? This is the weekend for you! This Sunday, March 29 at 3:00 pm, our very own Music Director/Card Shark Kent Campbell will be your host for our second Texas Hold'em Tournament. The tournament will be held in the parish hall at St. Bernard of Clairvaux, 10755 North 124th Street in Scottsdale. The buy-in is $50 per person with unlimited $20 buy backs during the first hour. For those of you less familiar with the terminology, you enter the tournament by purchasing $50 in chips. If you lose all of your chips in the first hour, you can buy $20 more (and keep buying in $20 increments if you are very unlucky but game for more). Half of the money raised will go to Pueri Cantores and the other half to cash prizes. Snacks and water will be provided and the basketball games will be on the big screen in the hall. If you would like to come, just give us a little shout out on Facebook or show up at the door. If we have a good idea of how many are coming, we can have the right number of tables set up which gets us started on time. Ladies, this is not a "Men Only" event, so come on out and win some of the prize money! Invite your friends - the more players the bigger the prizes! Come on out on Sunday and enjoy a fun afternoon of poker and March Madness without the loud, smoky and crowded "madness" of a casino. If you have any questions, please contact Kent at stbernardmusic@gmail.com. Pueri Cantores-St. Bernard of Clairvaux provides to young singers musical opportunities that build their appreciation of sacred choral music in the Catholic tradition, improve musicianship and understanding of Catholic liturgy, enhance their spiritual well-being, and raise the profile of choral music in church, school, community and artistic settings.